Brett and Shelia ! | Gods Love & Stories Of The Past? 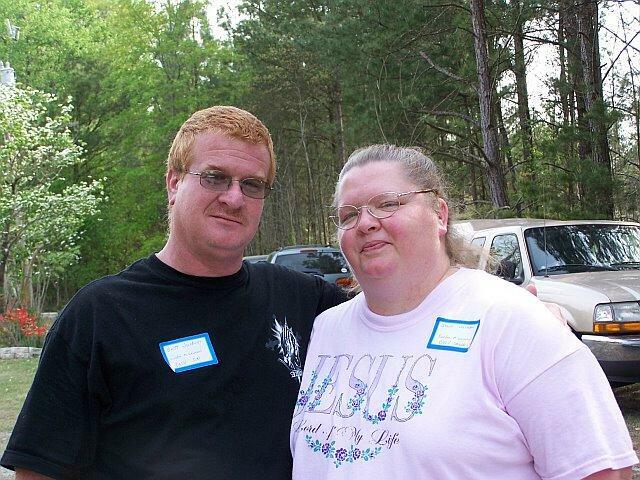 This is a picture of my son Brett and his wife Shelia? Brett is a truck driver and Shelia travels with him ! HE is 37years young ! Every body acuses him of being just like his Dad [ I’m kinda glad ] cause I had in mind for Him to carry on his Dad’s legacy and He’s doing pretty good at it already ? I’m saving the best picture for last and then I got to download one of Denise and Her husband and little boy ! Oh “amazing grace man”…They are such a nice looking couple!! Nothing wrong about that at all…following in his daddy’s legacy! Sheila is not ashamed of the gospel of peace..So nice! Jel is right…Brett DOES look like you!! What? You are saving the picture of yourself for the last? You are a funny guy. I got your email. Bernie laughed his head off! Yep Janice that saying ” like father – like son ” and he even sounds like me on the telephone too ? Terry Grandpaw taught me how to be ornery , I’m glad Bernie got a good laugh and I didn’t want to take anything away from my children so I’ll save the best for last ! Blessings. Ron. Great pictures, Ron. I have enjoyed seeing them. Have a great day. Thanks Amy I always like reading your posts and glad you dropped by ? Blessings . Ron. Hi, Ron, these are great photos. I know you’re proud of them all. I’m enjoying my time with Ella here in Virginia, and I’m recovering quite nicely from my fall the other day. I guess I’m still quite resilient or bouncy or something. I thought I was going to have two black eyes where my glasses smashed into my face, but it’s not too bad. I’m very thankful! Beverly I am glad you didn’t hurt any working parts . You would never forgive yourself if you couldn’t play with Ella and enjoy her ! Sounds like your fall might have hurt your pride more than you ? Blessings. Ron. wow you have some wonderful lookin family, you must be proud of them!! Thanks Bro. Tony for stopping by and the picture of your little girl is just like all the little children, you never know what they will come up with next ? Dana good to see you , and I will hold my chest out and say yes and that I got the prettiest grandchildren in the world ! Lol. and Blessings to you ! Ron. It is a joy to share the blessings of family…..thank you! Donna glad you stopped by and I enjoy the pictures you have posted ? Terry you sound like the typical lady that always want things done yesterday ! The reason I haven’t posted it yet is cause I wanted to keep all my friends a little bit longer? Blessings to ya’ll. Ron.